PRAYAGRAJ IS READY TO WELCOME YOU! PRAYAGRAJ, until recently Allahabad, is all set to host a million from abroad and lakhs of domestic pilgrims and tourists to the Kumbh Mela which kicks off on January 15, 2019, to continue right up to Mahashivratri on March 1-2, later. This is the Ardh Kumbh Mela which comes every six years as opposed to the Maha Kumbh Mela which comes every 12 years. Some of the most sacred days of the Hindu calendar fall during this time frame when devout Hindus of all denomination try to wash away their karmic sins of omission and commission by seeking a dip in the cold waters of the triveni sangam where the waters of the Saraswati, Yamuna and Ganga intermingle at the newly christened Prayagraj. Over the years the Kumbh Mela has become more than a religious pilgrimage for Hindus the world over. It has become one of the world’s biggest religious fair wooing all manner of scenes, sights and an ever growing population of spirituality seekers. Denying that the extravaganza of building a formidable infrastructure to host the mela this year was just a political exercise, a prelude to the forthcoming 2019 elections coming up, Nand Gopal Gupta said, “It is not correct to link the kumbh mela to politics. This is our Prayagraj and it is a sacred place for the people of the country…” This is the world’s “sabse bada mela” and UNESCO has listed it as “intangible cultural heritage of humanity.” All they are doing is boosting the infrastructure for the first time to showcase the event as a religious and cultural experience – given the large numbers of people who visit to pray at the Akshay Vat, Sarasvati Koop and Triveni Sangam. In this respect the entire Prayagraj area of some 30 km radius have been organized and beautified for the convenience and comfort of pilgrims. For the first time a deluxe and semi-deluxe temporary tent city featuring 250 km long roads and 22 pontoon bridges has been developed offering accommodation, meals, tours, facilitating holy river baths, prayers, puja…Indian culture will be showcased with Kala Gram and Sanskriti Gram and the entire Kumbh Mela area will be under the surveillance of Integrated Control & Command Centre CCTV cameras. 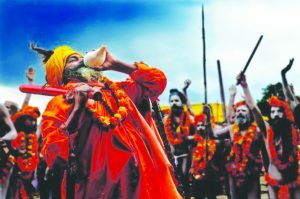 The UP government has stretched is budget for the Kumbh Mela this year to a whopping `7,500 crore for upgrading infrastructure comprising of accommodation, LED lighting, drinking water, sanitation aspects, lost and found services, road building, bridges, Ganga Pandal for 10,000 people, Pravachan Pandal for 1,000 people, four cultural pavilions where programs will take place and so on) and last but not least of all security concerns.